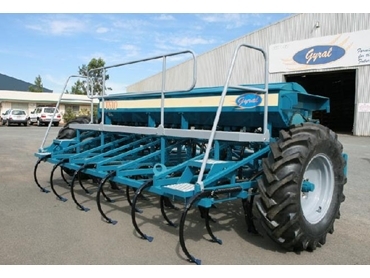 The T610 Series Star Seeder is Gyral's 'big brother' to the legendary TX Model. The robust, trouble free frame construction has been maintained in this series. Excellent weed control and free trash flow is achieved from the tyne layout and design. The features of the T610 start at the tyne assembly. An under frame clearance of 485mm (19"), results in a significant improvement in heavy trash flow. Hardened pivot pins (22mm dia.) and bushes will ensure a long life from these components. Adjustable tyne brackets with a variety of tyne options are available for planting rows to suit your requirements. Independent axles and a lift mechanism are all actuated through own rephasing hydraulic system. The high action lift gives a full 350mm road clearance and a maximum working depth of 150mm is more than generous. The tilther level adjustments, front to back and across its width, are simple and effective. A sturdy level lift pull assembly ensures that the cultivator works in the ground on the correct plane. All necessary hydraulic equipment is supplied as an integral part of the machine. Positive gear selection through Gyral's own high range gearbox makes fertilizer planting rate setting much easier. Fertilizer rate variations are not a problem with the T610. Our own patented vertical fertilizer star used in our early Star Planters has been retained in the T610 Series. Modern technology now produces the Star from a tough nylon based, non stick material. Positive, controlled metering system is the key to our fertilizer system. The tried and proven fluted roller system is maintained as our seed planting mechanism. A simple rack adjustment controls the planting rate. Double reduction sprockets are supplied with the machine to halve the seed shaft speed if required for low planting rates of summer crop. Grain and fertilizer cut off plates for individual rows are also available as required.